Designed by German design professionals Fingerhaus GMBH, the narrow little home that we are going to explore today is a fabulous example of how much innovation, style and finesse a small house can hold. The designers had a very narrow space to work with, so the result is a rather narrow home. However, the architecture is so unique and the interior design so sophisticated, that you'll finish looking at this project and your mouth will be wide open! People often think that white as a colour is quite bland and dull, but as we explore this home, we will also see just how gorgeous a white design can be. Not only does it make a space look and feel that much bigger but it gives a wonderful classic tone to the space. Are you ready to take a look at this little home with huge appeal? From the outside of the home, we can see that it looks like it has been stretched out of proportion. Your eyes aren't deceiving you, however! The home is three-storeys high with a very narrow design. Topped off with a traditional gable roof, this is truly a unique piece of architecture that merges a quirky flair with a traditional design. The facade is a simple white colour, working in harmony with the red-tiled roof and the wooden gates that flank the building. Can you see how simple can be so effective? The windows interspersed throughout the facade allow sunlight to flow into the interior of the home, creating a wonderful ambiance as we will soon experience for ourselves. If we head around to the backyard, we see how the interior of the home spills out onto a quaint little terrace area. Furnished with a little table and chairs, this is the perfect spot for dining outside in the sunshine and fresh air among the plants, trees and garden. The property at the back is large enough for the designers to have added a gorgeous rustic garage space for the cars, made out of wooden log. Also take a look at these 6 extraordinary garages to protect your car. 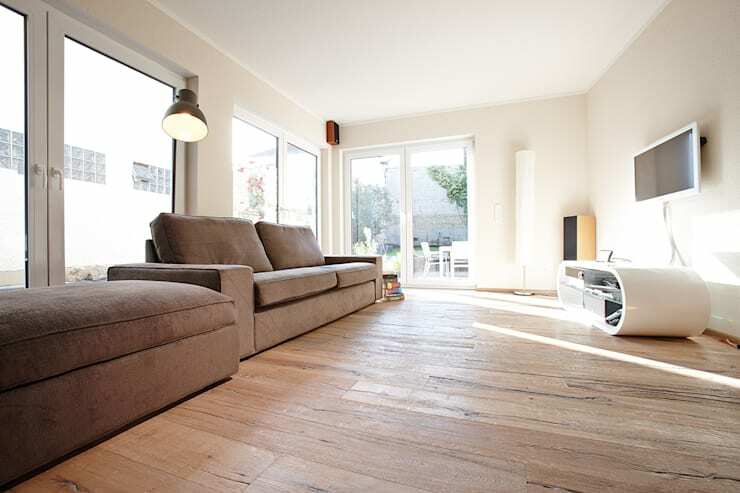 The inside of the home features predominantly white tones, with light wooden floors. This is a great neutral palette for a home that receives plenty of natural light as it reflects it, making for a very light and bright interior design. The living room features brown, cushy looking sofas, which reinforce the earthy tones. This is a family area that is proof of how function can collide with style. Don't you love the trendy floor lamp, which provides this room with a wonderful soft glow as well as a touch of edgy decor? The living room flows into the dining room, which again features very neutral tones. Yet the designers have added a touch of natural colour and charm to the space in the form of pot plants, a vase of lavender and a fruit bowl on the table. This is a great design tip for any home as well as any room in the house! Your staircase doesn't simply have to be a feature that takes you between the floors in your home. As we can see in this design, it can also contribute to the overall look and feel of the interior space. Opt for a staircase that contrasts with the colour palette of the home as well as a unique or stylish shape or design. While it's important to put safety first, making sure the stairs are easy to walk up and down and that there is a guardrail, you can afford to be a bit creative here. Have a look at these 13 staircases that you have to see to believe for inspiration. The bedroom in this home is a wonderful example of the power of minimalism. Only the most functional items have been included in this space – namely a bed and some bedside tables. The rest of the room is bare. This simple and sleek design packs quite a punch! It also ensures that the bedroom is truly a place where the resident can go to relax and recover from a hard day. There are no distractions and certainly no clutter or chaos. Remember that a tidy room makes for a tidy mind! Don't you love how the sunshine flows into the bedroom through the large window? This is wonderful because even though the ceiling is sloped, it looks big and spacious. 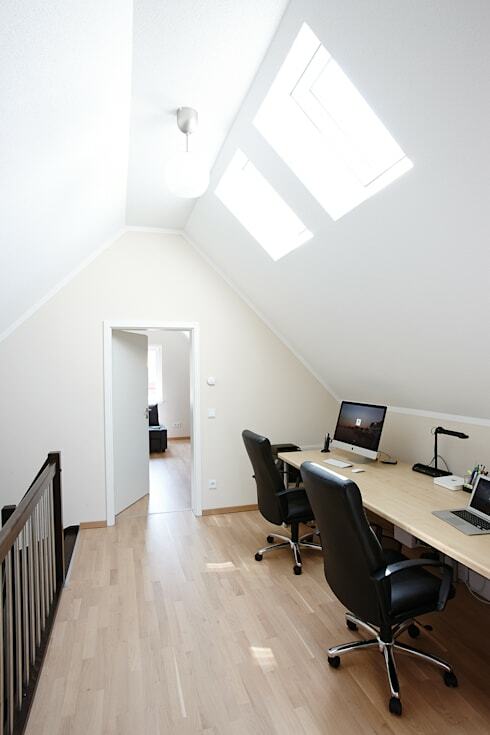 The landing of the second floor has been utilized as a home office. A large, narrow wooden desk extends across the entire length of the wall, giving the home owners plenty of space for homework or catching up on emails after work. The designers have added skylights to the ceiling, ensuring that this level is anything but dark and dingy. 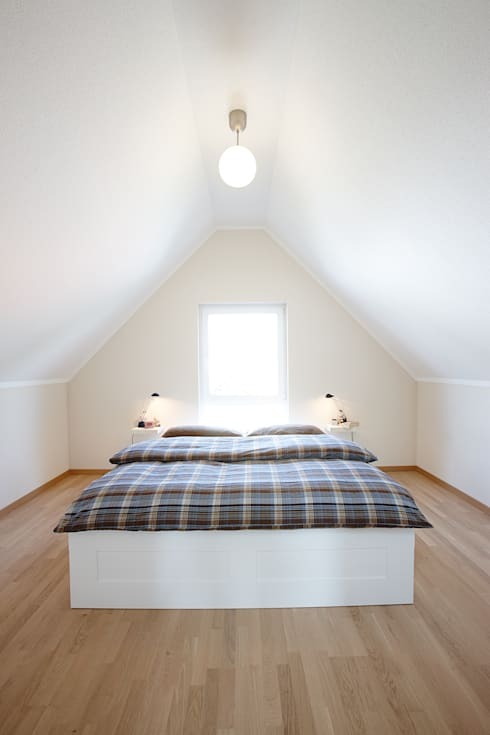 Skylights are a wonderful way to flood a home with natural light. 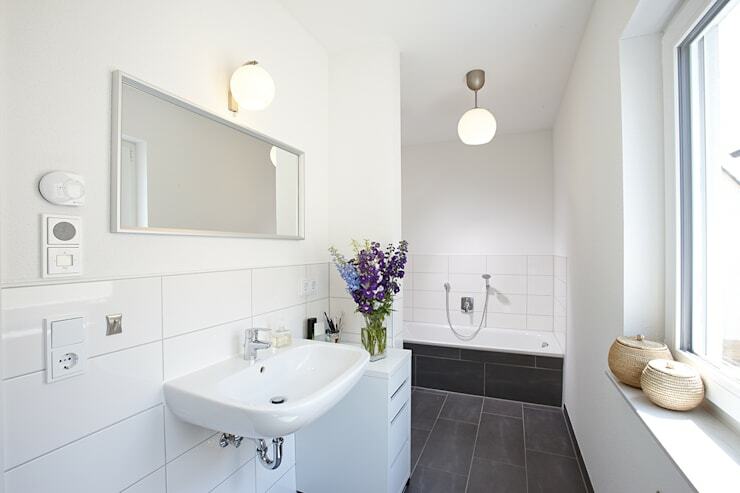 The bathroom also features predominately white tones with a sleek, grey tiled floor. 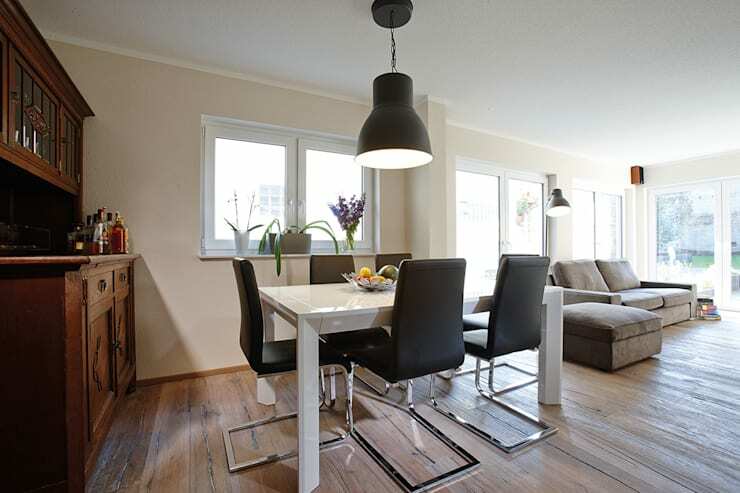 This creates a very clean and hygienic looking space that is serene and calming. Remember that you want your bathroom to be a tranquil space that prepares you for the day. A simple design like this achieves exactly that. Again we can also see how a vase of fresh flowers gives a room that something extra, while the mirror along the entire length of the wall adds a bit of depth to the space. If you have enjoyed this home, have a look at this home that shows white is more than alright. 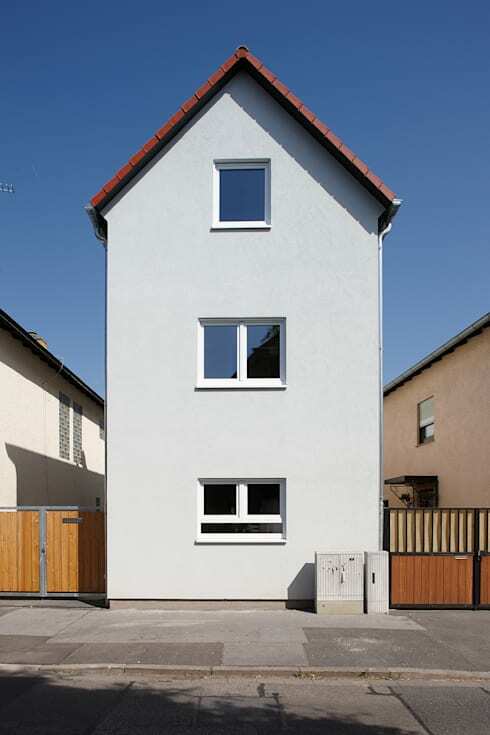 What do you think of this narrow little home?